His music is everywhere! You have probably heard, and maybe even hummed, a Harold Arlen song today and didn't even know it! Though he is most noted for composing the songs for the film "The Wizard of Oz," particularly Over the Rainbow, which was recently named the Number One Song of the Century, he has written over 400 songs including favorites like: It's Only A Paper Moon, Stormy Weather, I've Got the World on A String, and Ac-Cent-Tchu-Ate the Positive. 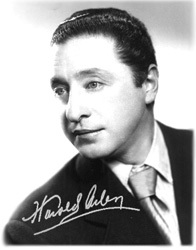 With this site, we invite you to learn about Harold Arlen, one of the Great Twentieth Century Composers, and his music. Here you can discover how Harold developed his musical career, browse through his catalogue of compositions, and listen to several samples of his works. Take a look at his life in pictures by visiting our on-line photo album. Find out where you can see and hear. We hope that you enjoy browsing the Official Harold Arlen Website. Please contact us with comments or questions.